The International Catholic Center of Geneva (CCIG) hosted a one week training session on United Nations Human Rights Mechanisms, in cooperation with UNESCO ETXEA. 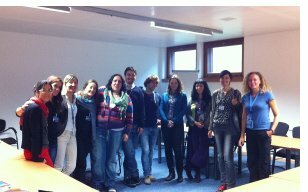 The training took place from the 24th to the 28th of September 2012 and was attended by representatives of NGOs from the Basque country. This training was the second in a series of training sessions starting in June 2011. Participants were introduced to key UN Human Rights Mechanisms through a combination of theoretical and practical approaches; they attended talks by keynote speakers, discussed with them effective functioning of Human Rights Mechanisms, and attended several meetings of the Human Rights Council. The informal exchange sessions, held at CCIG, were led by U.N. independent experts such as Mr. Alfred de Zayas, Independent Expert on the promotion of a democratic and equitable international order, officers of the Commission of Human Rights such as Ms. Stefania Tripodi, and other notable keynote speakers such as Mr. David Azoulay, Managing Attorney of the Center for International Environmental Law (CIEL), Mr. Roland Chauville, co-founder and director of the NGO UPR-Info, Mr. Jean Benoit Charrin, director of the WaterLex Geneva office and President of the CCIG, Mr. David Fernandez Puyana, director of the World Campaign on the Human Right to Peace, and Ms. Johanne Bouchard, researcher at the University of Fribourg and member of the Observatory of Diversity and Cultural Rights. These interactive sessions allowed for open communication and engaging discussions as participants were encouraged to ask questions and steer the conversation towards subjects that interests them most, such as human rights and the environment, cultural rights, and the right to water and sanitation. Since improving the effectiveness of NGOs’ work is one of CCIG’s main objectives, the center regularly organizes training sessions related to the work of the United Nations, focusing on the role of civil society organizations in promoting and protecting human rights. No Comments to "International Catholic Center of Geneva (CCIG) and UNESCO ETXEA Training on United Nations Human Rights Mechanisms"